Big insights and ideas tend to come from outside our own categories. To this point, here are some important ideas from more than 1,700 CMO’s across 19 industries and 64 countries. 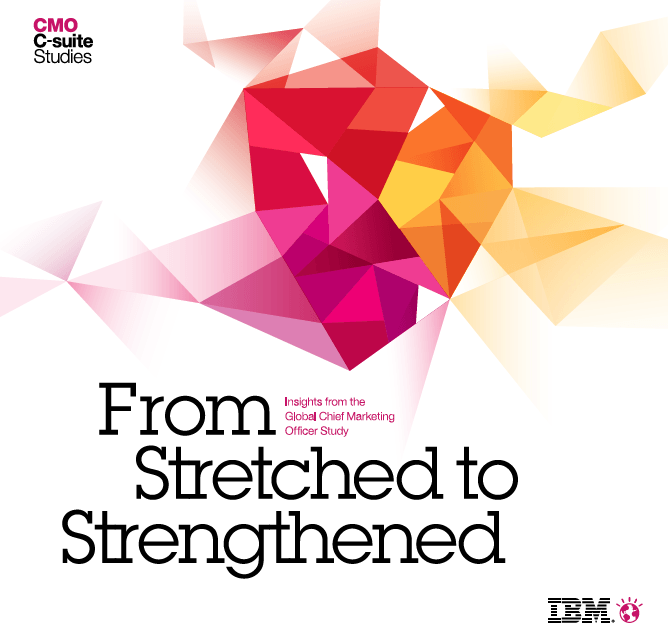 They were the participants in IBM’s Global CMO Study, focused on the forces changing business and markets today. • Four biggest challenges/game-changers were: the data explosion, social media, proliferation of channels and devices, and shifting consumer demographics. The most proactive CMOs are trying to understand individuals as well as markets. Customer intimacy is crucial. In fact, in IBM’s last CEO study, getting closer to customers was one of three prerequisites for success in the twenty-first century. • Advent of social media is challenging older, mass-marketing assumptions, skill sets and approaches. CMOs everywhere are aware of the distance they have to cover. The most proactive CMOs are mining new digital data sources to discover what individual customers and citizens want. • CMOs in the most successful enterprises are focusing on relationships, not just transactions. They’re using data to stimulate interest in their organizations’ offerings and form bonds with customers to a much greater extent than their peers in less successful enterprises. • CMO outperformers are committed to developing a clear “corporate character.” They recognize that what a business believes and how it subsequently behaves are as important as what it sells. And they make it their job to help management and employees exemplify the company’s values and purpose. • Most CMOs are struggling in one vital aspect — return on investment (ROI). Nearly two-thirds of them think return on marketing investment will be the primary measure of their effectiveness by 2015. But proving that value is difficult. Even among the most successful enterprises, half of all CMOs feel insufficiently prepared to provide hard numbers. The digital revolution has forever changed the balance of power between customer and organization. If CMOs are to understand and provide value to empowered customers and citizens, they will have to concentrate on getting to know individuals as well as markets and better grasp how individual customers behave. To effectively cultivate meaningful customer relationships, CMOs will have to connect with them in ways their customers perceive as valuable. This entails engaging them throughout the entire customer lifecycle, building online and offline communities of interest and collaborating with the rest of the C-suite to fuse the internal and external faces of the enterprise. Lastly, CMOs will have to quantify and analyze the financial results of their initiatives and communicate them to the entire organization to enhance their function’s credibility and effectiveness. They’ll also have to inject new skills into the marketing function by expanding the digital, analytical and financial capabilities of existing employees and by hiring staff or by partnering with specialists to fill the gaps. Here’s the link to study.